Tokyo's Pedal Days of Summer get underway in ernest this weekend with three big events so come along and get involved. Learn to bunny hop like a pro at this the first event of the Pedal Days of Summer. Beginners and intermediate riders alike can learn to get more height and distance, invaluable experience for anyone planing to take part in the Pedal Day Bunny Hop competition in August. In addition to bunny hop skills riders may also choose to brush up on the basics of trials riding under the eye of expert instructors. 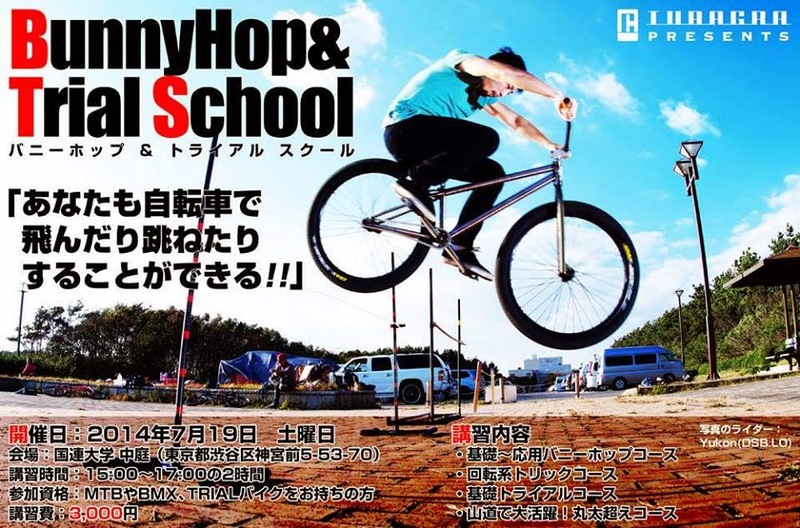 The Bunny Hop School will take place at the Aoyama Farmers Market from 3 until 5pm on July 19th and is open to anyone with a BMX or mountain bike and a sturdy helmet! More details can be found here. As it is the Ume No Hi (Marine Day) long weekend the Night Pedal Cruising Crew will host a summer/beach themed ride from the Aoyama Farmers Market to the waterfront at Tennozu Isle. Gather at the Farmers Market from 5:30pm on Saturday July 19, for a 6:00pm start and remember to get into the spirit of the ride by wearing an Hawaiian Short, board shorts, hat and sunscreen. Full details can be found here. Sunday July 20th the Night Pedal Cruising Crew will host another ride from 14:30. A slightly longer ride the route will pass through Aoyama Ichome and Akasakamitsuke before swinging by the Imperial Palace to Tokyo Station where riders can enjoy a short break and great photo opportunities. From there the ride will continue through Akihabara to Ueno Park and Ueno Station before ending up in front of Kaminari-mon in Asakusa. If you're new to Tokyo or just visiting this is a great way to take in the sights of the city, from the vantage point of your bicycle which allows you to really experience the city, not just observe it from behind the window of a car or bus. Gather at the Aoyama Farmers Market from 14:00 on July 20th for a 14:30 start. More information here. I will be at the Bunny Hop School, observing, not competing and will be along for the Umi No Hi Ride, so come along, and say hello. As always it promises to be a great social ride with a wonderful bunch of bicycle loving people. See you there!